For Steamworks Island, the we'll pit you against a variety of mutated plant monsters. But how did we make the creepiest, crawliest, ickiest plant monsters around? 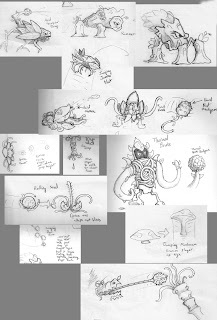 These are just some of the sketches we drew to help us visualize what our monstrous creations would look like. Not all of the sketches will make it into the final product -- in fact, most won't -- but this allows us to try out different ideas. Then we'll take the very best concepts and work them into Poptropica.